The USAID Southern Africa Trade Hub: Enhancing Economic Growth and Food Security through Trade. With a team of regional and international experts based in Gaborone, Botswana, the Trade Hub provides targeted technical assistance to governments, the private sector and civil society organizations to advance regional trade within Southern Africa. The Hub deploys modern trade facilitation tools to reduce the time and cost of transporting goods across borders, strengthens the competitiveness of select agricultural value chains, increases trade and investment in the regional textile and apparel sector, increases capacity for regulating and enhancing the clean energy sector, and improves the regional trade, investment and integration enabling environment through legal and regulatory reform. 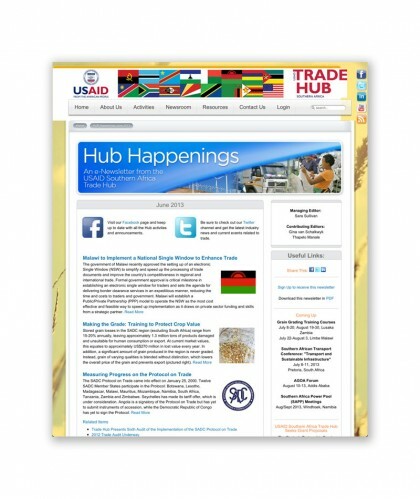 The Hub's monthly e-newsletter, Hub Happenings, highlights the Trade Hub's work and offers insights from the experts on a wide variety of relevant topics. Your name and contact details below will be forwarded to the Trade Hub. You will receive an automatic acknowledgement email first.